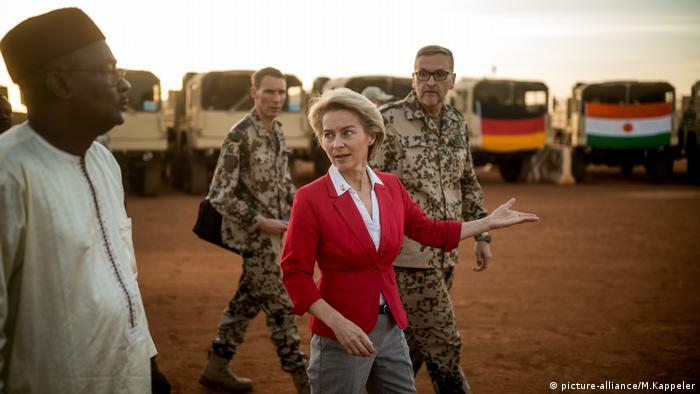 2018/12/11 – The German defense minister has called Niger a strategic partner « in the fight against terrorism, organized crime and illegal migration. » Nearly 900 German troops are deployed in the Sahel region, including 40 in Niger. During her visit, von der Leyen handed over 53 military transport vehicles to Niger Defense Minister Kalla Moutari as part of an « upgrade initiative » aimed at bolstering the country’s military capabilities. Germany’s 40 Bundeswehr soldiers stationed in Niger’s capital, Niamey, comprise part of the country’s contingent for the UN Multidimensional Integrated Stabilization Mission in Mali (MINUSMA). In March, Berlin signaled its intention to bolster its contingent in the peacekeeping mission and further support France’s counterterrorism force operating the region.